Hannah Genders advises on how to care for soft fruit. As some of you may remember, a couple of winters ago I created a fruit garden in the walled garden at the side of our house. It’s proving a great success and gives us lots of lovely fruit in the summer months, although it does tend to dry out quite a bit in a sunny spell in the summer. To counteract this I’ve been adding plenty of my home-made compost and every other year adding well-rotted manure. This extra care and some careful pruning has resulted in an abundance of fruit this year. I always encourage people to grow soft fruit – you don’t need a walled garden, as it will grow anywhere in a sunny site and can look very attractive. It will also save you money as soft fruits are always expensive, even in season. As many people are a bit daunted by the pruning side, I thought I would dedicate this article to pruning these fruits since November is the perfect time to do it. Although we group these together, actually blackcurrants are pruned differently to the other two so it’s important to remember which is which. Blackcurrants need pruning each year to ensure they crop well. The older branches on the plant will bear fruit but the quantity will decline as the plant gets older. Each year, remove one third of the oldest stems right back to the ground and take out any diseased branches or ones that look weak. The effect should create quite an open bush in the middle to allow air to circulate and cut down on disease. If you are planting new blackcurrants make sure you put them deeply into the ground with lots of well-rotted compost or manure. Redcurrants and whitecurrants also need pruning each year, but the technique is different: they bear their fruit on the old wood so prune them by cutting out the dead and low-growing shoots. 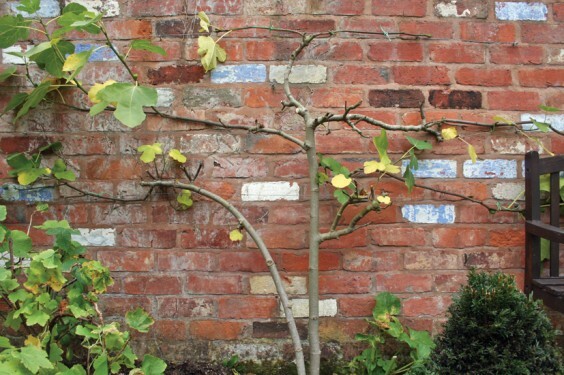 Then spur prune all the side branches – this means cutting back each side branch to three buds from the base and shortening branch tips by one quarter to an outward facing bud. Gooseberries are pruned in exactly this way too during the winter. There are two types of raspberries: summer ones that fruit in June and autumn ones that fruit from September onwards. They are pruned completely differently, so again it’s important to know which is which – I must confess I’ve got a bit muddled with mine so this winter I’m going to make one bed of summer raspberries and one of autumn. The summer raspberries grow the fruit on the next years’ growth, and this should be quite easy to see as it’s young and green. The old branches that have produced fruit will have gone brown and woody by now, so these can be cut out to the ground and the new young shoots tied into a frame of wires to support them. Autumn raspberries grow and produce fruit in one season so these are cut to the ground each February (November is a little early; if it is still warm and hasn’t frosted yet they will keep producing). Autumn raspberries do not need to be tied in so do not need the structure in place. Both lots of raspberries need a good mulch around the roots and an extra feed in the spring as they start to grow. If you have enough room and we get good summer weather, figs can be easy to grow in a sheltered position. I’m trying to espalier mine along the wall to keep the growth in check and create a nice feature, and it will also mean the fruit is easier to pick than from a large tree. For pruning, after the leaves have dropped, the vertical branches are removed down to the top wire and then thinned out to allow less of the branches to fruit next year. Any figs that have failed to ripen this season are removed, but the small pea-sized figs are left for next year. In a very cold spell the plant can be covered to protect these fruits from freezing and falling off. If you have limited space and a sunny, sheltered spot it is possible to grow fruit trees in a fan shape – I’ve just put in a peach tree using this method. Although most of the pruning is done in June, it is worth creating a protective frame to cover the plant from November to February. A plastic sheet hung over the tree would do, which stops the fungal disease peach leaf curl from taking hold and damaging the tree and fruit. It will also provide some frost protection during the winter months. A fruit garden really takes very little time to manage and creates a great amount of fruit in the season. If you fancy creating one yourself, now is an ideal time as most of the fruit bushes can be bought bare root and it’s much cheaper than buying them in pots.